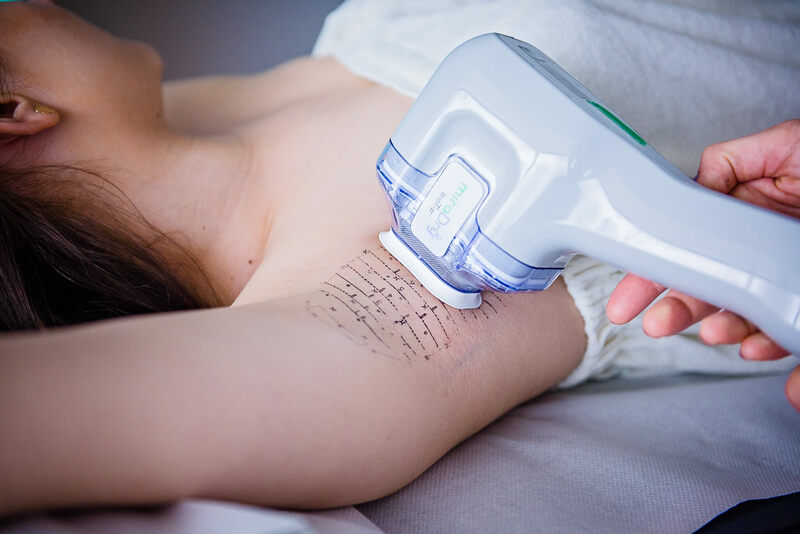 MiraDry is a simple, effective and non-invasive way to treat hyperhidrosis under the arms. Currently, this method provides the most durable results. Hyperhidrosis treatment using the MiraDry method is virtually painless due to applying of local anesthesia. During the treatment, a special head emitting electromagnetic energy to the armpit. As a result, the sweat glands are permanently blocked and they are not regenerated. effective – it reduces sweating up by 86%. Before starting the treatment procedure, it is recommended to look for the cause of hyperhidrosis – it may be a symptom of somatic diseases or disorders related to the nervous system. For this purpose, the doctor recommends some basic tests. The treatment is non-invasive. There is used local anesthesia then the person performing the treatment selects the appropriate level of electromagnetic radiation. MiraDry’s treatment is based on sucking sweat glands under the skin surface and deactivating them. The treatment takes about an hour. After the treatment, there may be temporary changes in the feeling of armpits, minimal swelling or irritation. It is sometimes recommended to use common painkillers. The convalescence period is short and the effects are noticeable immediately.